Is the Falco series really over? Who knows? The more people nag me about this, the more I am likely to say yes to get rid of them. I am concentrating on Albia, which I am much enjoying. I would like to keep an open mind on Falco and Helena. Of course if I ever felt inspired to write another, I could do – whatever I might have said previously… You may deduce I am on the verge of coming up with a really silly answer to thwart enquiries, eg I have licensed a franchise and Mimsy Bloggins (remember her?) is going to write thirty new ones. Can we have more detailed maps? Mad map-hobbyists will find the version of ancient Rome that I often use reproduced in Falco: the Official Companion. Buy that! My chief reaction to this stuff is sorrow – inventing your own characters and creating a new fictional world is such good fun, I pity the authors who have such paucity of courage and imagination they can regurgitate someone else’s idea. And how feeble of editors to accept this second-rate dross. 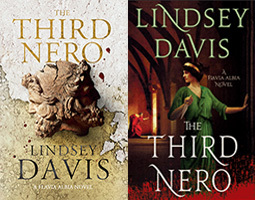 It is insulting to readers too; the rationale is that people who like one Roman series will read anything set in that period: well I think you may be fooled once – but that’s it. My readers prefer something original. This is not my job. You have to be your own first critic. Brutally look at your work and decide whether it is commercial, original and ready for the market. If it is not commercial, dump it. If it is not ready, work on it. If it is both, send it straight to an agent. Evaluation is their job. If it is just plain unoriginal, don’t despair. Publishers love what they already know. You don’t realise how many manuscripts I am asked to look at – or how ghastly most are. I am sorry to sound ruthless, but brutality is what you must expect from agents and editors. Getting a first novel published is very, very hard. I have an absolute rule that I never review novels that are set in the ancient world. (Nor books that don’t have women characters or a sense of humour, that do have cats, magical realism, time slips, the supernatural, psychiatry, religion, or Birmingham but you can’t tell that it’s Birmingham. And I loathe novels about Famous Men by male professors of history). Why? I am perfectly calm. I have always said that I don’t really want to write about the eruption. For one thing, Pliny described it so well (his classic and very famous description is still used by vulcanologists) that there is nothing left for a descriptive novelist to say. And then this was a real tragedy. The Boxing Day tsunami confirmed my view that such an event is not really suitable for light, entertaining novels. So, I don’t want to put Falco and Helena there – and if they are somewhere else and just hear about it, that will be a bit of a cop out… We have a few years before I have to commit myself, and I may never bring the series as far as that. I have been asked whether Falco and Helena might be killed amidst the lava – absolutely no chance! Domitian cleared the informers from the Saepta Julia (so, in fact, did Titus) and of course there is enmity between him and Falco since ‘The Silver Pigs’. So people worry about what the paranoid Emperor, famous for his brutality to senators and his own relatives, might do to our hero. I don’t. He has spent a lifetime escaping from difficulties, after all. Perhaps it will be time for him to retire to obscurity. Perhaps it will even be time for me to retire! I never commit myself absolutely, but there are two reasons why I shall probably not write a prequel about Falco and Petro, much as I know it would appeal to young or youthful male persons! Firstly, I couldn’t have Helena in it, as Falco definitely meets her for the first time in ‘The Silver Pigs’; sorry, but I really don’t feel drawn to writing a book without her now. And then, I don’t myself really want to know what went on. If what this disreputable pair say about their army career is all true, then I’d be ashamed of them! Or maybe they exaggerate… Sometimes, there is much to be said for leaving things unsaid. I prefer not to know whether they were bad boys, or very shy, or just normal insignificant recruits with unformed characters, whose story is in truth not very interesting. And I personally think it is more horrific and effective if the events of the Revolt are left as a grim shadow over them that they won’t really talk about. I am sorry to disappoint.